My almost-review is timely for two reasons. The first is that I see that I wrote the second of the posts linked above exactly a year ago today – why I should repeatedly write about this subject on my birthday is anybody’s guess. The second reason is that Sy Garte has just published a favourable review of the new book by ID proponent Michael Denton on BioLogos, the potential importance of which for healing the scrappy bitching between Evolutionary Creationists and Intelligent Design people he rightly references on his own blog here. It is interesting not only that non-IDers are calling for a change to the Neodarwinian paradigm in biology, but that there are so many different fruitful scientific approaches quite apart from specifically ID arguments. Denton’s approach in the new book, for example, is structuralist, akin to that of Richard Sternberg who was more or less forced into the ID camp by the professional hatchet job done on him by defenders of the ruling paradigm. Structuralism is about natural laws underlying the patterns seen in the forms of living things, and operates quite independently of the accepted mechanisms of mutation and natural selection. It is usually forgotten that structuralism was the ruling idea when Darwin went out of favour until the “modern synthesis” of the 20s and 30s took control. Yet there is little or no reference to structuralism in Mazur’s book, though it covers nineteen significant and innovative workers in biology. Mazur is extremely well-informed, and has her own interests, which arise from those people she has already interviewed. But the effect of her repeating sometimes similar questions to the various interviewees is to act, herself, as a catalyst for the exchange of ideas. It’s clear that the new discoveries are so diverse that many are unaware of what is happening in other fields, and how it may connect with their own work. The net conclusion from all is that the Neodarwinian paradigm is either defunct (so Denis Noble and Carl Woese) or in need of major extension or revision (so Eugene Koonin). What is clear is that there will not be one intuitively self-evident replacement idea like Darwin’s”natural selection” when this occurs. On the contrary, life is turning out to be as absurdly complex and multi-faceted as, say, human history. There are, for example, the complexity theories themselves (like that of the physiologist Noble), which deal with emergent properties, but inevitably bump up against Aristotelian ideas of self-organisation and form. Teleology is also inherent in the “natural genetic engineering” of James Shapiro, which I’ve covered here for example. But there are many others, amongst which some recurrent of the themes are the importance of epigenetic mechanisms and, in contrast, the sidelining of the “gene” as anything but a loose analogical concept. Incidentally, “natural selection” is similarly interrogated as to its very coherence as a concept – not to mention being limited in the role it actually plays to that of a conservator, not an innovator. The idea that the genome is a highly interactive database network, rather than a blueprint of “genes”, is now an assumption amongst these guys, rather than a possibility. The idea that you can identify individual genes for this and that is, despite GM and designer drugs, so last century. Non-Darwinian “horizontal” processes like gene transfer and symbiosis are starting to be seen as ubiquitous, not rare (with a consequent blurring of the meaning of “the tree of life” and “common ancestry” both), and in particular the role of viruses is being explored as a major – or perhaps the major – source of genetic innovation. A far cry from the “viruses are satanic” attitude of some prominent TEs just a year or so ago. To say that 10% of our genome is viral is no longer shorthand for “junk”, but an indication of the interdependence and cooperation of life. Even our microbiome – whose cells outnumber the “human” cells in our bodies by 10:1 – is now being seen to contribute significant amounts of genetic material to us (and presumably vice versa). Apart from these physical issues (though a reductionist word like “physical” begins to look rather out of place in the discussion of life), people like Eva Jablonka stress the importance of non-biologicals like cultural inheritance to evolution. I almost forgot – the word “epigenetic” covers the surprising rehabilitation of Jean Baptiste Lamarck’s assertion of the inhertance of acquired caharacteristics. It’s now proven. in fact, few of Neodarwinianism’s “exclusive claims” remain unchallenged: the tree of life and common ancestry are being severely redefined, acquired characteristics are proven to be inherited robustly, the “central dogma” of the irreversibility of the DNA->protein transition is plain wrong, and so is the validity of the Weismann barrier, which says that somatic changes cannot enter the germ line. Gradualism is out, and saltation is back on the scientific agenda. This book, I would say, is a must-read if you want to get a general overview of what current ideas are around, and just how parochial the old science is rapidly beginning to look. I, for one, can no longer take seriously a scientist who tells me that evolution is simply a change in gene frequency over time. That’s like saying that the whole of art is defined by different colours on paper. The main message I want to raise from this, in the context of science-faith issues, is that most of the work that has been done to accommodate theology to Darwinian science is going to have to be re-done, as some of us would have predicted on principle: he who marries the spirit of the age soon finds himself a widower. Those who have, in contrast, accommodated Darwinian science to Christianity, through retaining the traditional strong doctrine of providence, for example, will simply be able to transfer that understanding to whatever new science comes along. But those who have offered the selfishness of evolution as the inevitable cause of human sin, for example, rather than the inexplicable fall of a sinless Adam from fellowship with God, look very silly once evolution is shown to have no connection at all with selfishness. The biggest challenge, I think, will be that the new science is so complicated intrinsically, and in its range of mechanisms, that it will be difficult for Christians to spot the underlying metaphysical commitments that colour the work its practioners produce. It’s hard enough in Darwinism, even though it should be obvious from Darwin’s own religious background and the militant materialism of its staunchest defenders, quite aprt from the mountains that have been written on the metaphysical background to Darwinism. But despite Michael Denton, the new biology doesn’t self-evidently point to theism. It can certainly be used to argue for it – for the obvious internal teleology of what amounts to a tangled mass of separate causes, resulting in the beautiful and balance biosphere we all experience, really requires God as the overarching organizer. This may be valuable in focusing on the true design argument – that design is seen in the outcomes, far more than the mechanisms. As Aquinas argiued, if there is wise order in the world, a Wise Orderer is far more probable than chance. Not all see things that way, however. One thing that one sees recurrently in Mazur’s book is how drawn a number of the researchers are to the process philosophy of Whitehead (as distinct from process theology). The glimpsing of a pattern in the tangled web of natural causes clearly suggests mind, but in the secular scientific climate generated by quantum strangeness, the idea of that mind as arising interactively between the constituents of the universe is something of a attraction to the religiously non-committal. That is even a danger in theistic evolution, whose own recent intellectual heritage has drawn a lot from process thinkers like Peacocke. So my message to TEs is this: take note of the new science, because the old is being superceded (“for the times they are a’changing”). But don’t make the mistakes that were made with the old science of seeking to rewrite your theology to match the “assured findings of science”. Get your doctrine right, from first theological principles, and Christ will be found to be as sovereign in the new system as he was, in fact, in the old. First, happy birthday Jon. All the best for today and the future. Second, thanks for the tag to my review on Biologos. I will mention here that I was a just tad nervous about its reception there when I submitted my draft, but I needn’t have been. Jim Stump was very positive, and I got some great feedback from Kathryn, and I believe Deb also took some notice. The bottom line is that the Biologos group (at least those in the head office) were quite pleased with the review, and are fully behind it. I believe this bodes well for future discussions between Deb Haarsma and other TE leaders and some of the folks at DI. I dont think we are all going to break out in “Cumbaya” around the campfire in the coming months, but I like the direction. So far, at least. Lets stay tuned and see if any further reaction comes in, (from any side). As for Third Way and the extended synthesis (or whatever we are supposed to call it) I fully agree with your comments about its challenges for Christianity. I made a not very coherent go at this, (not letting my ignorance of theology, stop me) in a couple of papers, one in PSCF and one in God and Nature (both coming out in the next two months). What I said, and its about all I can think of to say at this point, is that the EES opens up evolution and expands or extends its boundaries far beyond what we had with neo Darwinism. The gene isnt dead, but its title as Lord of all Life is severely diminished. And although I never found anything much off putting about randomness of mutations (which does seem to bother a number of Christians) randomness is also losing its exclusive hold on variation producing mechanisms. 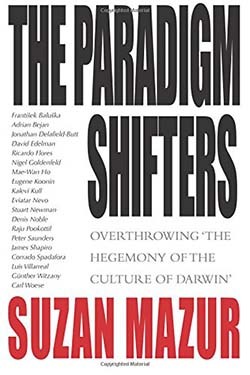 Of course, as you say (I havent read Mazur’s book yet), the science of the new evolutionary biology is far from settled, and I trust there will be some excitement in future. What we need to do, is exactly what you said. Hold to the principles of the faith, and have trust that there is one truth from God. Christ will indeed show us the way, in the lab, in the field, in our brains, and in our souls. I should expect that on your next birthday, we might have even more to celebrate. Agreement with all the above, Sy. If you read get to read Mazur, you’ll see why I was less wholehearted about the centrality of common descent and the tree of life than you in my remark on BL. It’s not so much that some of these ideas are suggesting life forms are not connected relationally, but that if a tree consists largely of grafted branches from who knows where, to speak of a single acorn producing the great oak is just unhelpfully inaccurate. On that, some of the workers in that book (including Woese) point out how Neodarwinianism has overly concentrated on animals (where, at least till recently, vertical transmission has been considered the norm), as opposed to bacteria, Archaea and even plants. As for randomness, the whole problem (once more) hinges on the doctrine of providence, I think. On both sides of the evolution-creation divide, there have been many with little real concept of providence – so many theistic evolutionists have insisted that chance is ontolological, and independent of God (and so argued that God’s planning things would have been despotic – which suddenly looks dated when the processes are found to be less random). Creationists, too, have often made the same theological assumption in saying God wouldn’t create things “by chance” – even though (as I said in a recent post) one needs a strong doctrine of providence for quite uncontroversial matters, such as that God intended US to be born, despite the stochastic nature of fertilization. At least on the TE side, there seems a lot more consistency in placing God’s sovereignty over randomness in the traditional way – though precious little consistent teaching on that basic theology has appeared on BL – just erroneous descriptions of occasionalism applied to ID to muddy the waters! Both need to read Aquinas better, or the Calvinist Reformers. “Non-Darwinian “horizontal” processes like gene transfer and symbiosis are starting to be seen as ubiquitous, not rare…” ? If so, I’d ask them why “gene transfer” would be important if genes (not epigenes) are not important to genetic innovation. “Interactive” in what sense? In the sense that the current “blueprint” for animal X could interact with something sufficiently to become the blueprint for animal non-X? “Interactive” – areas of the genome interact dynamically with other parts to produce all their usual affects and so control the organism (which is why the term “gene” is an oversimplification). But the organism also interacts back to control gene-expression or even to re-write the genome in various ways. In other words, “control” is a bad word to use either way: everything affects everything else, and the organism has to be seen (as Aristotle or Goethe said ages ago) as a single integrated entity, and no longer as a machine made of parts. That has no bearing on the evolution of new species directly, but it does go along with the discovery that the genome is incredibly leaky, even in higher organisms. The interaction and exchange, it’s now found, includes adopting big chunks of genomes from the viruses that infect us (thus potentially altering the species saltationally), and the virus in turn will have had its own genome altered by adopting genetic stuff from its former host (like a chicken, or anything). So in a real way, viruses have contributed chunks of chicken DNA etc, to us – and the question is not whether it’s possible, but what that means. The questions for Christians to answer as the new science develops are, on the Creationist side, since such large genomic changes are found in real life, how would that not lead to new species – or, more positively, can Creationists produce a science of “kinds” in which the created form is maintained however big the changes in the genome. That’s actually potentially fruitful research, facilitated by the idea of the genome as a database, rather than blueprint: I could still be “me” even if I change the library I use. On the evolutionist side, the work is to decide how God brings the created order out of a whole ragbag of apparently haphazard biological processes involving viruses, shifting genomes, epigenetic changes etc – to me, the key is recognising God’s handiwork in the results, regardless of the processes, and maintaining a strong doctrine of providence. No, the questions are on *your* side. The questions would be on *my* side – the Creationist side – IF anyone had ever discovered and/or demonstrated large natural genomic changes that made animal X an animal non-X. But no such discovery or demonstration has ever been made. And today’s coelacanths are the same as those of supposedly 400 million years ago. IF we observed a “homo pollo” or a no-coelacanth, THEN the questions would be on my side – the Creationist side. But they’re on your side. But if that’s really the case, one wonders why you spend so much time writing about this stuff. Ah, but there must be a good reason, because you spend so much time reading it. The “facts” of evolution have become, shall we say, very fluid. To me, the antidote to “nobody knows nuffin about anyfin” is knowing why scientific mistakes were made in the first place. So looking at the beliefs that made the Neodarwinists reject Lamarckism so radically (when Darwin himself accepted Lamarckian mechanisms) helps understand what needs to change – and to make one more aware of one’s own presuppositions. Now it’s true that theories of deep time came into being for reasons: in geology, uniformitarianism v catastrophism (a false dichotomy) suggested the great age of rocks. But there was enough truth in uniformitarianism that, once catstrophic change was rehabilitated, the age of the earth remained obvious. Similarly, Darwin thought his gradualist process would need huge timescales too (fortnately for him already suggested by geology), so one could say that science “needed” to find great ages, as the Creationist literature says. But the fact is that it didn’t take much to find such ages – nearly every measure, even when only approximate, came out against a 6000 year earth (but not against a 6000 year Adam – which is all the Bible actually gives approximate indications for – remember Archbishop Ussher is a relative of mine by marriage!). Even ANE history in Egypt and Mesopotamia goes way back before Adam’s time both chronologically and culturally. However, I agree with you that fossils provide a bedrock set of evidence, albeit incomplete, of what actually happened: they, at least, are pure data rather than models (unless one wereone of those Creationists who said they are models, put in the earth to fool sinners into evolutionism – I hope such views are rare now. I don’t know what you mean by either segment. Well, I presuppose some knowledge of science history. Uniformitarianism in the early nineteenth century was the big new thing, and so like all new things seen as always true, replacing the prevalent idea that the world was formed from a series of catastrophic events (the last, only, being Noah’s Flood). As time went by views moderated – uniform processes do operate over long times, but there are also catastrophic events like asteroid strikes, ice-ages and so on. The bitter debate was unnecessary. But once uniformitarianism had opened the door to an ancient earth, many different things confirmed it, despite the realisation that sometimes stuff happens suddenly. Jon, I scan Science, Nature and PNAS every week, except last week when I was in hospital following one or more strokes, and I missed the paper on reverse translationase. Reference please. Ah, Preston – like every damned thing in evolution, “central dogma” is a tweedledum phrase that means what people choose it to mean at the time. So even Crick hadn’t worked out fully what he meant – which hasn’t stopped the absolute term “dogma” being maintained as if he had used the word ex cathedra. I maintain my right to be equally non-rigorous in a book review on a blog!